DOWNLOAD OUR PRESS PACK with facts and information. There are three species, the Bornean orangutan (Pongo pygmaeus), the Sumatran orangutan (Pongo abelii) and the Tapanuli orangutan (Pongo tapanuliensis). The orangutan’s preferred habitat is low-lying peat-swamp forest. Their distribution is influenced by fruit availability and are rarely found above 500m. Being arboreal (tree-dwelling), orangutan populations are difficult to estimate. Numbers are estimated by counting their nests combined with satellite imagery. According to the recent Population and Habitat Viability Assessment (PHVA) in May 2017 there are an estimated 57,000 Bornean orangutans, 13,000 Sumatran orangutans and 800 Tapanuli orangutan in the wild. 80% of orangutans live outside of protected areas. 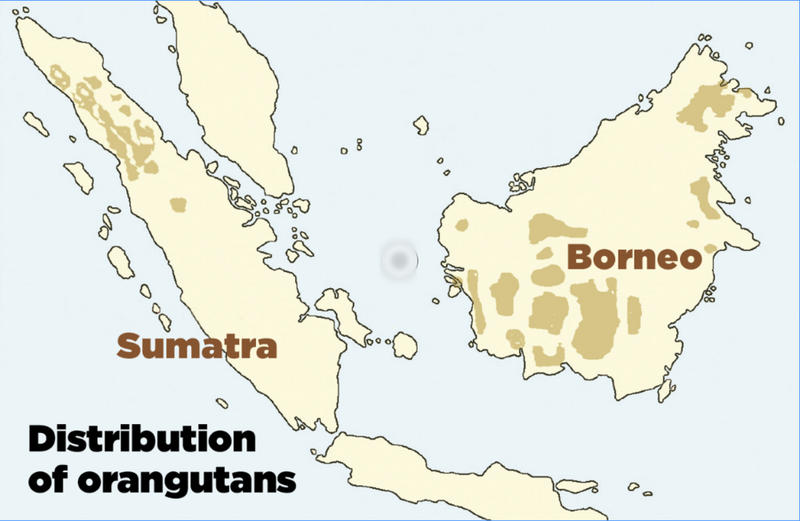 Fossil evidence suggests that during the Pleistocene era, from around 1.8 million years to 11,500 years ago, orangutans lived throughout much of Southeast Asia, from Java in the south, up into Laos and southern China. Orangutans are known to eat over 400 different foods and during times of poor fruiting they will eat less nutritious food such as bark and leaves. Orangutans have an important role in seed dispersal. The seeds from the ripe fruit are adapted to withstand passage through the orangutans' gut. The seeds are excreted in their own small pile of faecal matter that helps them to germinate and grow. Orangutans are a vital cog in the workings of the rainforest ecosystem. Mona, an orphaned orangutan in our soft-release programme, eating fruit. The word orangutan means ‘person of the forest’ and orangutans are perfectly adapted to their habitat. Their long arms and feet like hands allow them to grasp branches mean they travel with ease through the forest canopy. As orangutans open up the forest canopy by breaking off branches and creating gaps. This allows light to reach the forest floor, which helps the forest to regenerate naturally. Orangutans make and sleep in a new nest each night. Like all great apes, orangutans they have large brains, are self-aware beings, capable of reasoning. In the wild, orangutans use tools such as sticks to extract insects and honey to eat. When it rains they will cover their heads with leaves, which act like an umbrella. In captive or semi-wild conditions orangutans have been taught to use sign-language. Orangutans are semi-solitary which is unique among primate species. The scarcity of food means orangutans spend up to 60% of their day foraging (looking for food) and competition for food leads to this solitary life. The largest group being a mother and two offspring. The courtship period lasts between three to ten days and males share no role in the upbringing of their offspring. Orangutans are the slowest breeding of all primates. On average, they give birth every eight years -the longest inter-birth interval of any land-based mammal. A female orangutan will normally have no more than three offspring. Their low reproduction rate puts orangutans at considerable risk and can drive local populations to extinction. Young Bornean orangutan with mother. By Ian Wood.